The i300 was produced during 1985 and 1986 along side the i200 and i240, It was fitted with the straight 6, 3.0 litre engine taken from the larger Opel models such as the Omega. 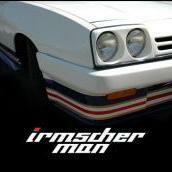 In 1982 Irmscher had some unfinished Manta 400 bodyshells, which featured a different suspension arrangement more suited to a heavier running gear and the idea of the i300 was born. 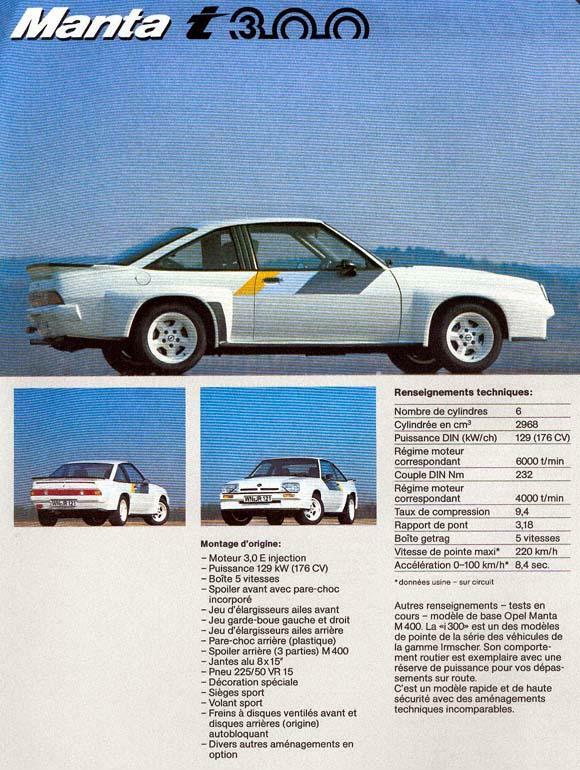 Using the heavier 3.0 litre engine and the sturdier Getrag 265 gearbox from the Omega and Monza mated to the Manta 400 chassis, the i300 was a rare and unusual model, with a potent powertrain. Once again the Manta 400 Rally car quad Halogen headlamps and boot spoiler were used. The standard suspension was extensively modified to accept the heavier engine. As per the i240, the standard front brakes were replaced by vented discs with bigger calipers, and a Limited Slip Differential was also fitted. The i300 Interior, followed on with the traditional Irmscher theme using Recaro seats with the same black 'Opel Sport' cloth as featured in the other models.Generally the coupe bodystyle was left unaltered, making the i300 visually similar to a standard GT/E. The performance of this model however was exceptional, with 177 bhp on tap in standard tune. Many tuning options were available to order, which could increase power output to over 200 bhp. Once again the methods of identification are similar to the i200 and the i240. The i300 was available at the same time as the other Irmscher offerings but due to the fact that it was almost double the list price of a standard GT/E it only sold in small numbers. It is believed that only 1 RHD i300 was imported via the UK franchise, even on the continent it was an exceptionally rare model. 2969cc 6 Cyl Fuel Injected engine.